Total solar eclipse from Roberts, Idaho. Skywatcher Black Diamond 80ED at 1400mm using a Baader FFC Barlow lens. A total solar eclipse is a lifetime event that excites, astonishes and mesmerises the observers under the Moon shadow. There is a lot of preparation, information gathering and effort required to carry instruments all around the world but then, the wonder rewards all the hard work done. The last eclipse occurred on the 21st August 2017 and it engaged millions of people as it moved across the USA from coast to coast. Total solar eclipses are rare and their frequency in the same location on Earth is every 375 years! However, being predictable, they can be planned long before the date. Eclipses have to be observed in the narrow totality band but along this path, the duration can vary drastically. 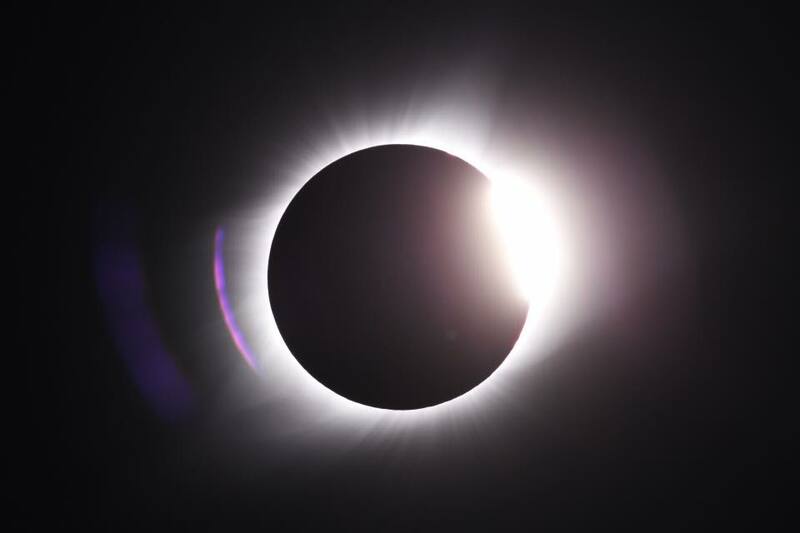 In West Oregon the eclipse lasted for only 2 minutes while in Kentucky its duration was up to 2 minutes and 40 seconds. Nevertheless, it is better to find a place that combines good weather statistics, fair accessibility and the longest totality duration possible. Casper in Wyoming was my choice but 8 months prior to the event all the accommodations were already fully booked and I only found a campsite on Casper Mountain. The photographic equipment consisted of two Sky-Watcher 80EDs which is a valid, transportable and sharp apochromatic refractor. The choice of bringing two identical instruments was to have two different scales of the eclipsed Sun: one on direct focus for a wider field and one with a Barlow lens for taking pictures at higher magnification. As for the previous eclipses, I decided to automatise the photo shooting script so I had the chance to enjoy the view. Forecast will mess with your plans! As soon as the earliest forecast became available on the web, some clouds were predicted over Casper. Panic! All my plans, scheduled road trips and accommodation bookings became useless. I constantly checked multiple weather websites but the situation appeared compromised by a 30-60% cloud cover. Three days before the totality I decided to change my plans and I booked another camping in Roberts (Idaho) where the forecast promised clear skies. The camping was in a perfect place as there was plenty of space for the equipment and the horizon was flat to enjoy totality at 360°. The night before the event, I aligned the mount to the northern celestial pole and I repeatedly checked the forecast. The day after, all the telescopes and cameras were ready well before the totality but Eclipse Orchestrator, the software that would run the programmed camera shots, did not work! In these moments, a combination of excitement and anxiety did not allow me to think clearly on how to solve the problem but a computer reboot fixed the problem! Ready to go! The countdown for the beginning of the partiality ran precisely and within a few seconds the moon appeared in the field of the Sky-Watcher Maksutov 90/1250mm. It is quite impressive to see how quickly the Moon moves but nothing is out of the ordinary until the Sun is covered up to 90%. A few minutes before totality the sky was still bright but the planet Venus appeared on the right hand side of the eclipsed Sun. The atmosphere was surreal as the environment was tinted by an intense yellow tonality caused by the colour of the border of the Sun disk. While in normal condition a shadow appears fussy, soon before totality they looked sharp and clear. That happened as the light comes from a thinner source of light i.d. the thin sickle of the Sun. Then the computer software said: one minute to go! The heart beat fast, the temperature dropped and the air was tense but everything ran well: the mount kept tracking, the sky was completely clear and the computer was precisely controlling the shots of the camera. A few seconds before the eclipse I saw the black Moon moving across the Sun, it was like a perfect gigantic clock running smoothly and accurately. “The diamond ring! The shadow is coming!” The totality began when the umbra of the moon arrived at more than 3000 km/h colouring the sky at 360° with all the colours of the twilight. Venus and the star Sirius were clearly visible in the sky and through the binocular Bushnell Legend HD 8×42 Regulus was well noticeable beside the Sun. The totality revealed the perfect alignment between the Moon, the Sun and Venus that made me feel on a planet ruled by perfect movements. The Corona was the most spectacular object in the sky. This is the external atmosphere of the Sun and it is only visible during the short totality period. It was as wide as 8-10 Moon diameters and it looks like a delicate white embroidery. A few moments before the totality ended, two red prominences showed up on the right hand side of the Sun. Then, the bright Sun photosphere reappeared and the show ended with an abrupt return of the light. Total solar eclipses are the most spectacular events of the nature and they produce addition! Be warned. So far, I watched four total eclipses and I look forward to observe the next one that will take place in Chile on the 2nd July 2019. Sydney will be one of the few lucky cities in the world that will host a total solar eclipse on the 22nd July 2028, so save the date!